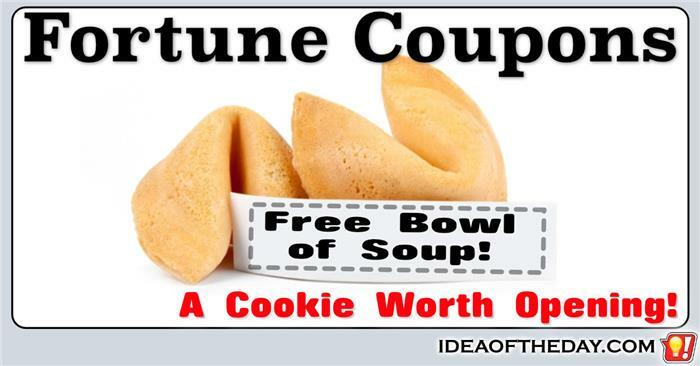 A Fortune Cookie with a COUPON Inside! Chinese restaurants are missing a great opportunity to use Fortune Cookies as a way to increase business. One of the best parts of eating Chinese food is getting a fortune cookie after your meal. Even people who don't eat the cookie look forward to getting one just so they can read the clever message inside. In recent years, companies that make fortune cookies started printing messages on both sides of the paper inside, After all, why waste the space? Unfortunately, the back of most fortunes are still pretty much a waste of space. Most of the time they include a useless collection of lottery numbers or lessons on speaking Chinese.